Thank you so much for a great job done. This is the second time I have used you and both times the flowers have been just what I wanted. Also like the way you send photos as I am overseas at the moment, so would have not been able to see them. Your P R is absolutely awesome so thank you, thank you, thank you! Need a Flower Delivery on Sunday? I'm So Sorry - Unfortunately there is No Floral Courier service operating on Sunday's in Auckland. You will find this is the same for all Auckland Florists as we all use the same Flower Delivery Auckland Courier Companies. I know of only one Florist in Auckland who does do Sunday Delivery - but their Delivery Charge for this is $70!!! See here> Or pick-up a bouquet from the Florists in the Malls such as St Lukes, Manukau City, Botany Downs etc where the florists are open shopping mall hours. Why not Order Now for FRESH Monday Delivery? Our Flowers arrive FRESH from the Market on Monday morning - We are busy florists with fast turnover of flowers so we buy fresh from the flower markets and local growers 3x a week, so our flowers are guaranteed fresh and your gift will be beautifully presented. Best Blooms is a Very Popular online florist - In Fact - We have just celebrated, sending out online flower order number 40,000 to our many happy customers! 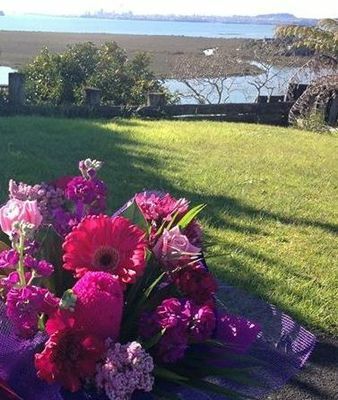 We are Award-Winning Auckland Florists - Our prices include Free Delivery so you know exactly where you stand when ordering. We stand behind our work and our service with a 100% Rock-Solid Guarantee. You can Trust us to deliver your beautiful flowers on time and as ordered on the day you request. Free Delivery in Auckland - Order Now for Monday!